This time of the year is probably the best time (at least in our hemisphere) for World AIDS Day. Our twenty four hour days are filled with more darkness than light in December than any other month of the year. In some places it can be very dark and dreary, indeed. It’s an appropriate time of the year to remember the darkness of HIV. The darkness can be frightening. We have sometimes been very afraid here in our communities, in our states, in our country and in our world, because at times, it has been very, very dark. 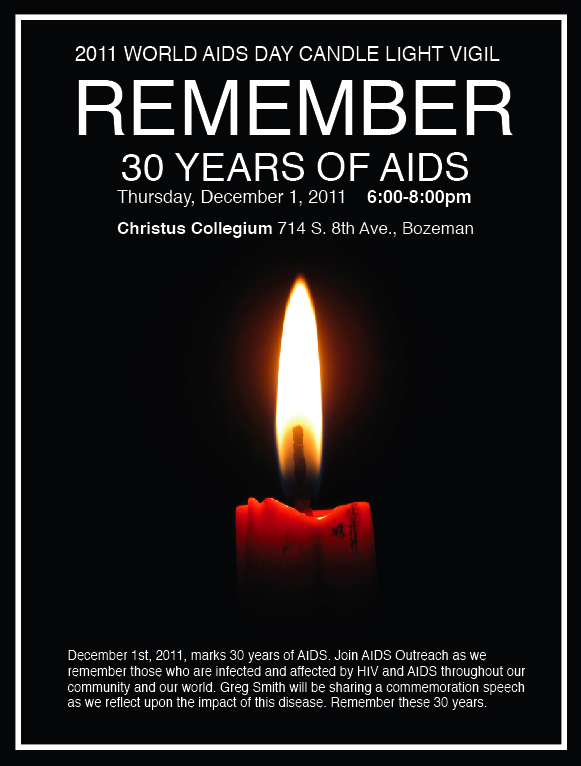 I especially remember the darkness and terror of 30 years ago when AIDS made itself known. I also remember the panic that ensued- people bullied, driven from their families, homes, schools and places of employment out of fear and ignorance. Gay men were shamed and vilified openly by politicians and communities and churches. I remember the shame that halted progress for research, treatment and prevention. I especially remember people- my friends- who wasted away in front of my eyes. Some died painfully and alone- their families too ashamed to ask for help or proper care. We have lost good men, women and children to HIV/AIDS. Families have been broken, beautiful lives have been twisted by suffering. It has been very dark, indeed. But in this darkness, in this December, there always flickers the promise of light. This disease can now be treated- treatment is now quite possibly the key to prevention. Shame has decreased. It is not gone, but it has decreased. In this promise of light, I remember with gratitude the people whose bravery has driven away darkness. Whose voices refused to give in to hopelessness or complacency or fear. They got us here. HIV is still here; it is still among us, it is still causing fear and shame. But the voices of reason and compassion have grown stronger. You have heard those voices. You also are those voices. And when we use our voices to proclaim the truth- that disease is not a reason for judgment and shame- the light grows stronger. When we refuse to give in to fear, we change for the better- and so does the world. As a gay kid growing up in Montana, I remember walking in the cold dark of a wintery Big Sky, feeling alone, misunderstood and very small. But I also remember being under that same dark sky with friends and family, working happily to build a bonfire beside the skating pond. The dark of the night is no match for the voices of friends- especially when they’re united in a common purpose. The darkness never really goes away- but it’s also never a match for the voices and presence of friends. Especially when there’s a fire to build. This entry was posted in HIV and tagged candles, history, HIV, hope, World AIDS Day.